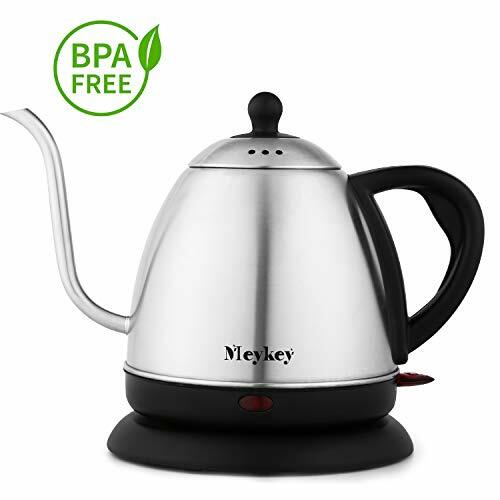 MeyKey Electric Gooseneck Kettle brings you back to the old age with its neck. Also provides convenience with modern technology. Give you a slow, controlled and precise flow of water that is optimal for extracting the most flavor when you brew coffee or tea using the pour-over method. The thin neck is good for making tea. The long sprout, it is so much easier to pour hot water into cups to make tea or coffee, no worries of water spilling. All steel construction interior, nary a plastic screw or plastic bit in contact with water. The handle is also easy to hold and won't get burn. Sturdy and comfortable to hold and pour. The right size for your morning pour over cup, is good for 2-4 cups of tea. Great for small spaces. It looks like Aladdin's magic lamp, cutest teapot. Unique appearance design, gooseneck water outlet. The bottom charger has a charging cable. 1.Before cleaning the electrical kettle, unplug it and wait until it cools down. 2.Do not touch the sides of the kettle when boiling water.The stainless steel material will get very hot.Keep children away and grip the handle only to lift the kettle.